Nature's Response Hand & Nail Lotion is a light cream that soaks into the skin quickly, leaving no greasy residue just a refreshing scent. Organic Lemon Scented Tea Tree Oil is a natural antibacterial and antifungal agent with a lovely fragrance. The Manuka Honey in Nature's Response is Active Manuka Factor +10 that promotes healthy skin healing. Wheat Amino Acids help to moisturise and condition nails. Ingredients: Aqua • Glycerin • Stearic Acid • Glyceryl Stearate SE • Cetyl Alcohol • Paraffinum Liquidum • Dimethicone • Phenoxyethanol • Mel (Honey) • Carbomer • Tocopheryl Acetate • Wheat Amino Acids • Sodium Hydroxide • Citral • Benzoic Acid • Leptospermum Petersonii (lemon scented tea tree) oil • Dehydroacetic Acid • Ethylhexylglycerin • Polyaminopropyl Biguanide • EDTA • Potassium Sorbate. I picked this up cheaply in a local pharmacy and have been very happy with it. 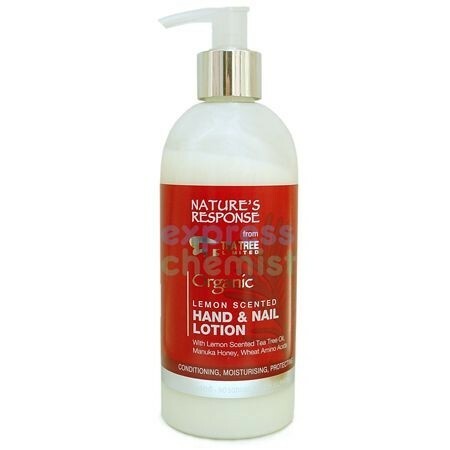 It feeds my poor dry hands daily and makes them smell nice of lemon verbena so leafy citrus sort of scent and very natural. "I picked this up cheaply in a local pharmacy and have been very happy with it. It feeds my poor dry hands daily and makes..."